Why Play at 888 Poker? If you are a new player, just sign up and you will get $88 absolutely free! No need to deposit, just jump straight into the games! Along with the $88 free Bonus, new players can also take advantage of regular reload bonuses, freerolls and the First Deposit Bonus of 100% up to $600, exclusively for FTR members! Of course, many rooms offer competitive bonuses, but unlike many rooms, 888 has a significant player base, which allows players to find a game at any time of the day even at high stakes. Along with the beginner friendly atmosphere, top notch software and support, 888 poker definitely deserves its spot among the top tier poker rooms. FTR Members are eligible for an extra Bonus on top of their First Deposit Bonus. While the regular bonus is 100% up to $400, by downloading the 888 client here, you can get a special 100% up to $600 bonus! No promo codes are necessary, simply follow the link, download the client and make your first qualifying Deposit. Along with the topped off $600 first deposit bonus, new players also get a $88 Bonus Package just for registering, no Deposit needed! Simply register your account and validate your e-mail, after which $2 in cash, $6 in tournament tickets and an $80 Bonus will be instantly credited to your account. The $88 Free Bonus and 888 poker bonus can be activated together and have the same clearing rates. The $88 Bonus is released in $8 increments, with each increment released after the player has earned 20 Status Points. Players earn one Status Point for every $2 spent in rake, which means that for each $40 in generated rake, you will received an $8 increment. This makes for a 20% return. The First Deposit Bonus is released in $10 increments. Each increment requires players to earn 25 Status Points, which is $50 in rake. This sets the return of the First Deposit Bonus at 20% too. 888 Poker’s VIP Program consists of VIP Statuses, which allow players to earn Reward Points and exchange them for cash, tournament tickets or goodies in the online shop. Check out the Full Review of the 888 Poker VIP Program where we break down all of the levels and perks. 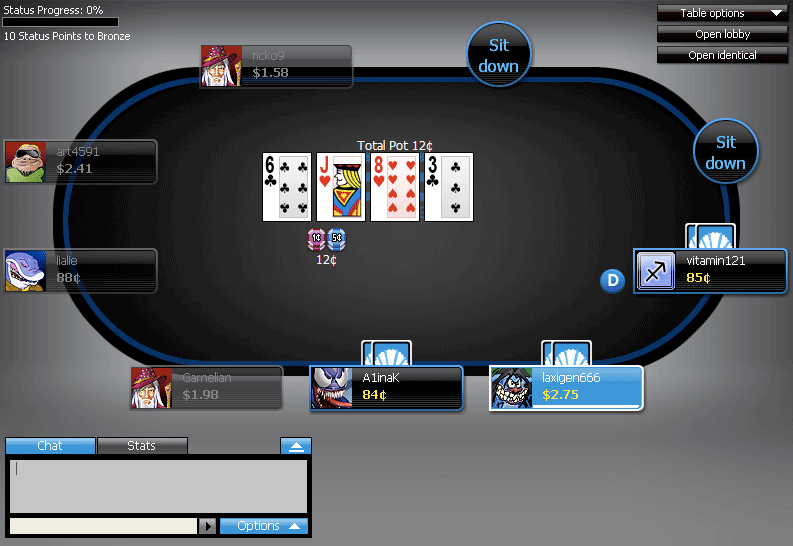 888 Poker was launched in 2002, though back then it was known as Pacific Poker. 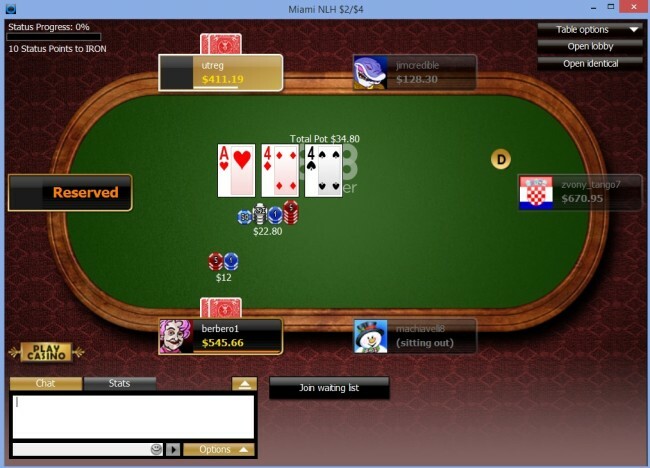 Up until 2006 when UIGEA was passed, Pacific Poker was one of the biggest online poker rooms in the US, unfortunately, with UIGEA came a mass exodus of poker rooms from the US and Pacific was one of them. Despite the huge blow that was the loss of the US market, 888 continued its operations, growing steadily every year and avoiding multiple takeover bids along the way, most notably by Ladbrokes in 2007 and the very recent takeover talks between 888 Holding and William Hill. The former $1.47 billion deal came very close to fruition, but talks fell apart at the last minute. After exiting the US market, 888 was left well outside the biggest poker room list, but just six years later, they were once again at the top, thanks to their long term strategies. In fact, pulling out of the US in 2006 is now starting to look like a smart move since many states have begun legalizing online poker. Poker rooms that stayed in the US after UIGEA was passed will now have a very hard time re-entering the US market, while 888 poker is already partnering with operators all across the US and is already present in all States where online poker has been regulated. As the new age of online gaming rolls around, operators are rarely sticking with offering poker exclusively and opting for a more extended set of offerings, such as casino games and sports betting. While 888 did not escape this trend, they also kept their focus on improving and refining their poker games. 888 was one of the first rooms to offer partial segregation of beginners to allow them to acclimate to the game environment, as well as webcam tables and mobile poker offerings, all of which allowed them to become as popular as they are now. 888’s software is very user – friendly. Most people who open the 888 client for the first time will feel as if they have used this software for years. Overall the lobby can be a bit cluttered with promo’s, but still easy to navigate. Unlike many poker rooms that seem to try and cater only to specific player types, 888 has a universally suitable approach to tables. A maximum of 9 tables can be opened at the same time, which is perfectly suitable for the majority of experienced players. 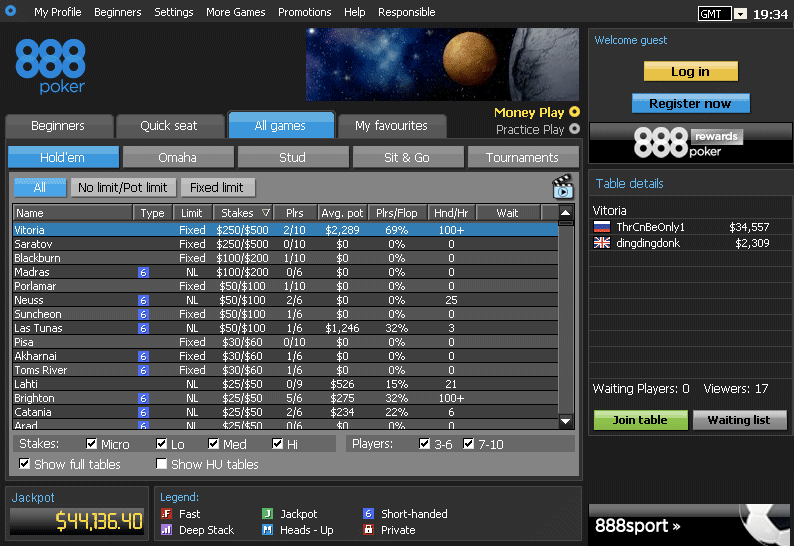 On the other hand, 888 offers tables which are only suited to beginning or recreational players, like their beginners tables for new users and webcam only tables. 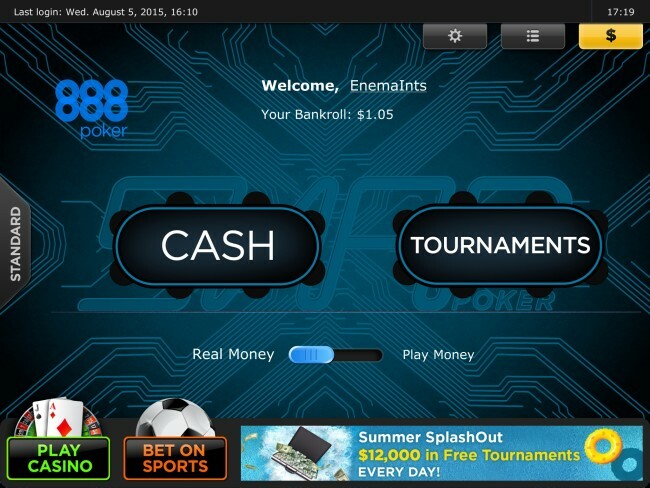 Check out our detailed 888 poker download review for even more information on the software and mobile app. For what it’s worth, in a climate where online cash games are being squeezed from all sides by new game formats and overall game toughness, 888 poker’s cash games are one of the best you will find. Thanks to their policy of segregating beginner tables, a lot more new players stick around and eventually make it to the regular cash games, resulting in more action and fun games all around. Cash game traffic on 888 is the second biggest in all of online poker. During the last peak season, which usually rolls around in winter, 888’s cash games saw an average of 3,000 players at any given time with peak hours welcoming more than 4,000 players. The best way to guarantee yourself plenty of action is to jump into the games on weekend evenings, when player numbers soar. 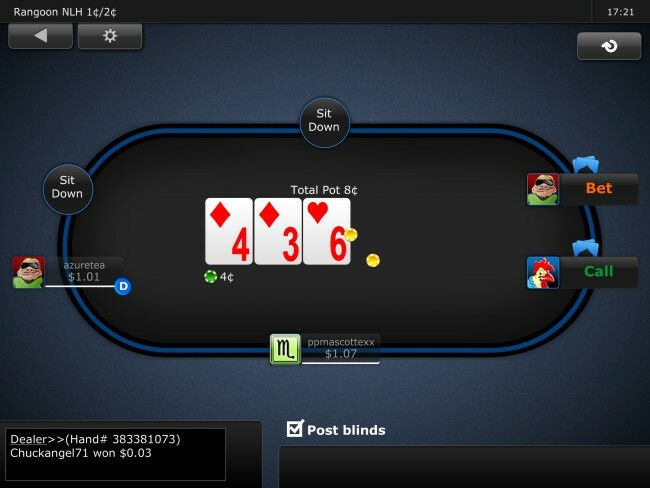 When it comes to game formats, Sit & Go’s are perhaps the most undervalued at 888 Poker. Though they are readily available in different formats and buy-in’s, Sit & Go’s are rarely the focus of any major promotions and perhaps most surprisingly, 888 Poker is the last major poker room yet to add the incredibly popular Spin & Go tournaments. Sit & Go traffic on 888 is definitely less abundant than cash game or tournament traffic. While you won’t have any problems finding a game at low to mid stakes, high stakes Sit & Go action is virtually non-existent, except for peak hours. When it comes to tournaments, 888 Poker has some of the best offering out there. The daily tournament schedule includes a decent amount of mid to high stakes tournaments and the Sunday line-up features great tournaments with massive six-figure prize pools. 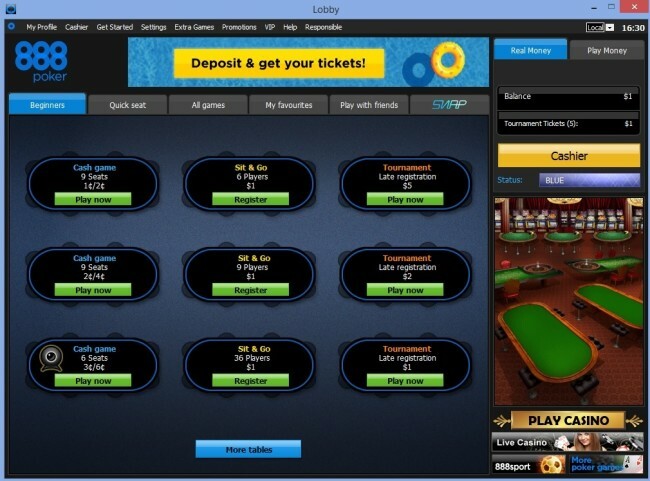 Most tournaments attracts hundreds of players and some even cross the thousand player mark. This is also true for Sundays, where flagship tournaments like ‘The Whale’ and ‘The $100,000 Mega Deep’ attract sizable player fields. 888 offers players dozens of Deposit methods, though they do vary by country, so even though you might find yourself in a position where only 5 to 10 methods might be available to you, that should be plenty, especially since Credit and Debit cards as well as the most popular e-wallet option will be available almost everywhere. 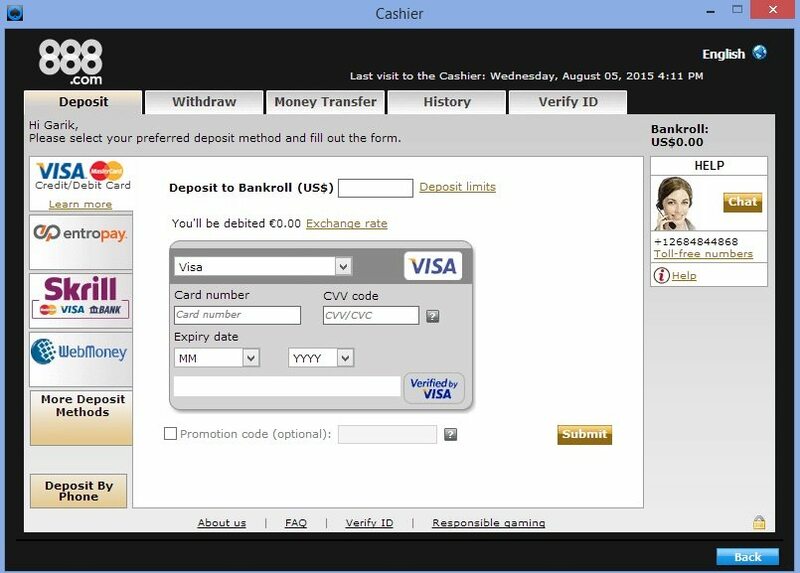 To make a Deposit, simply click on ‘Cashier’ in the 888 Lobby, choose your preferred Deposit method and fill in all the necessary information. After that, the Deposit will be processed instantly, except in cases of bank transfers. Players should always keep in mind that poker rooms only ask to verify your identity when you withdraw money for the first time, so the easiest way to avoid this process popping up all of a sudden when you are just about ready to see all that hard-won money, is to treat it as part of the registration process and simply send all the necessary documents as soon as you register a new account. As far as withdrawal options go, 888 offers about a dozen options, including credit card withdrawal and e-wallets. Waiting times can range widely depending on the chosen methods. Even though 888 mentions that e-wallet withdrawals can take up to a few days, most of them are processed within hours if not instantly, while credit card and bank transfer withdrawals can very well take up to a week to process. 888 Poker’s mobile client is focused primarily towards cash games and Snap cash games, though tournaments are also available. The mobile app is available for both iOS and Android devices and offers players a great mobile gaming experience. The mobile app is very well designed and offers only the most important functions of the full 888 client. This makes it very user friendly and hard to make a mistake like clicking the wrong button during play. 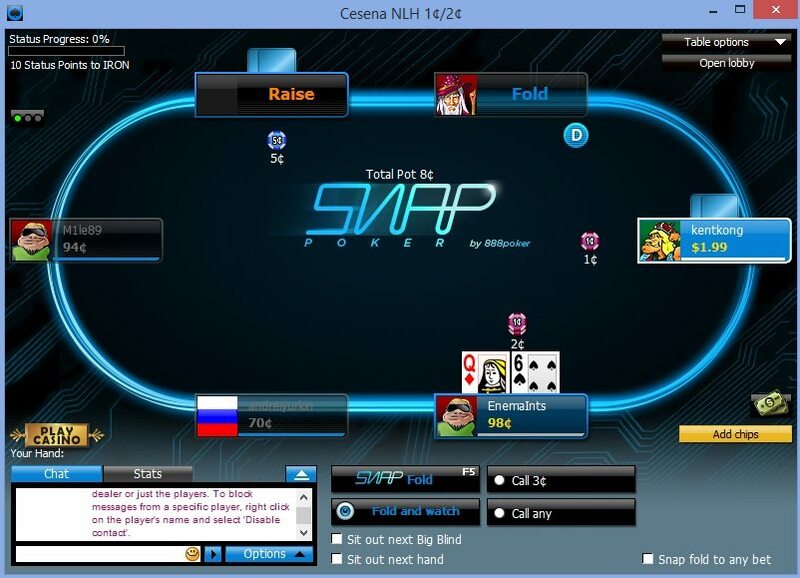 Perhaps the biggest drawbacks of the app is the lack of multi tabling and no access to 888’s webcam tables. Other than that, the app is pretty solid. 888’s online help section features a lot of questions which players may potentially have, so if you are searching for an answer to your question, that’s a good place to start. If the help section is no help, you can e-mail support at support@888.com or contact them by phone at 00 35 042693. Between their growing player pool and the focus on attracting new customers, 888 Poker is currently one of the most attractive online poker rooms for any type of player. Even though it has its drawbacks like any other poker room, in this case positives outweigh them quite significantly.